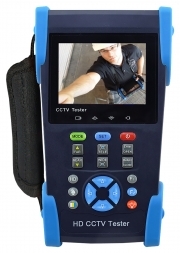 The 7 inch touch screen IP camera monitor and tester is designed for maintenance and installation of IP cameras, HD over coax cameras (TVI, CVI, SDI, AHD), and analog cameras as well as other security equipment. The 1280x800 resolution enables it to display HD cameras and analog cameras in high resolution. The unit supports many HD over coax PTZ, ONVIF PTZ and analog PTZ controls. The tester is also a great tool for Ethernet network testing. It can test PoE power voltage, perform PING tests and IP address scanning. You can use the blue cable tester to check the termination and cable type of network cables. Other functions include providing 24W PoE power to your IP camera, an LED Flashlight, 12VDC 2A power output and much more. Its portability, user-friendly design and many other functions make the IP BUDDY+ ALL IN 1 an essential tool for all installers or technicians. CCTV Video balun kit. BNC Male to 2 conductor screw terminal block. 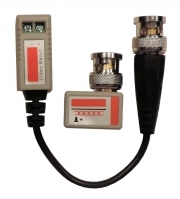 Allows a single video signal to be transmitted over a single unshielded twisted pair (UTP) wire. Color video up to 400 meters and B/W video up to 600 meters. Passive operation, no power required. Compatible with Analog, HDCVI and HDTVI. 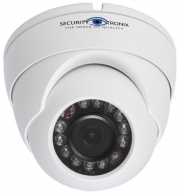 The ST-HD-D3.6-2MP is a high-definition fixed lens camera designed around a 1/2.8” Color 2.4 megapixel CMOS with IR LEDs providing infrared capability up to 65 feet, and a 3.6mm fixed lens. The ability to send HD video over coaxial cable makes the ST-HD-D3.6-2MP a cost effective high-definition surveillance solution for any budget. The HD-COAXINATOR™ series utilizes the same coaxial cable, connectors, and power plugs as a traditional analog CCTV system. The series is priced like analog and delivers resolution like IP, but without video latency or other difficulties found when dealing with IP based systems. Integrators can easily upgrade existing systems from analog to HD by simply replacing the old DVR and analog cameras with HD-COAXINATOR™ cameras and CVR digital video recorder. 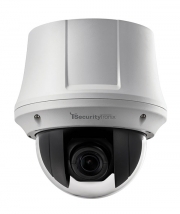 The ST-HD-TD3.6-2MP is a high-definition camera designed around a 1/2.8” Color 2.4 megapixel CMOS, 12 IR LEDs providing infrared capability up to 65 feet, and a 3.6mm lens. The ability to send HD video over coaxial cable makes the ST-HD-TD3.6-2MP a cost effective high-definition surveillance solution for any budget. The HD-COAXINATOR™ series utilizes the same coaxial cable, connectors, and power plugs as a traditional analog CCTV system. The series is priced like analog and delivers resolution like IP, but without video latency or other difficulties found when dealing with IP based systems. Integrators can easily upgrade existing systems from analog to HD by simply replacing the old DVR and analog cameras with HD-COAXINATOR™ cameras and CVR digital video recorder. 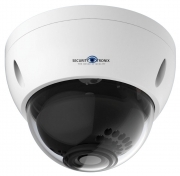 1 Megapixel HD-TVI Outdoor PTZ Camera, 720P TVI, IP66 weather rating, PTZ 23X 4mm to 120mm Optical Zoom lens, 16x Digital Zoom, Control Over Coax, 24VAC Power supply included, Mounting brackets sold separately. 1 Megapixel HD-TVI Indoor PTZ Camera, 720P TVI Indoor Flush mount, PTZ 23X 4mm to 120mm Optical Zoom lens, 16x Digital Zoom, Control Over Coax, 24VAC Power supply & mounting materials included. 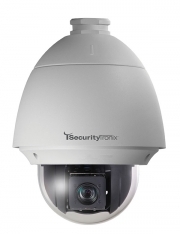 The SecurityTronix ST-HDoC is designed for maintenance and installation of HD-CVI, HD-TVI, AHD and analog cameras as well as other security equipment. It’s 3.5” 480 x 320 resolution screen enables it to display images from HD cameras and analog cameras in top quality. The unit supports HD over coax, PTZ, ONVIF PTZ and analog PTZ controls. In addition, the tester is also a great tool for Ethernet networks and cabling systems. It includes the ability to test network cables while verifying the sequence of the individual conductors. The meters portability, user-friendly design and multi-function capability make it an essential tool for installers and technicians, greatly improving work efficiency and simplifying installations and system maintenance.